Graduate teaching assistant Heather Whidden presented her paper, “Interpreting the Stitch,” at the eighth annual ACS Gender Studies Conference, titled “Gender Across…,” at Southwestern University in Georgetown, Texas, in February. 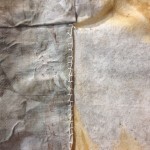 The stitch: it passes through, passes through, again and again until the two bodies it connects are one object connected by the recorded and repetitive action. Two entities are now tied together with this running, weaving and repetitive mark. Repeated stitching reinforces relationships and tethers their future. 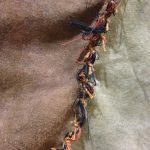 Recurring stitches build a familiar bond where a single stitch is a mere acknowledgement that the two may belong. When gesture satisfies, conclusion is recognized; the separation is mended, restoring the relationship. It is not enough for the two to be joined. Gesture insists on telling how it was mended and how identity was built. Whidden, a candidate for the MFA in art from The University of Alabama in May, 2016, taught courses in 3D Design and assisted in courses in sculpture and ceramics during her time as a graduate student. She presented her MFA thesis exhibition, (Re)pair, at the UA Gallery in Tuscaloosa’s Dinah Washington Cultural Arts Center in April. She was also juried into the 5th Annual National Juried Exhibition at Marshall University in Huntington, West Virginia.